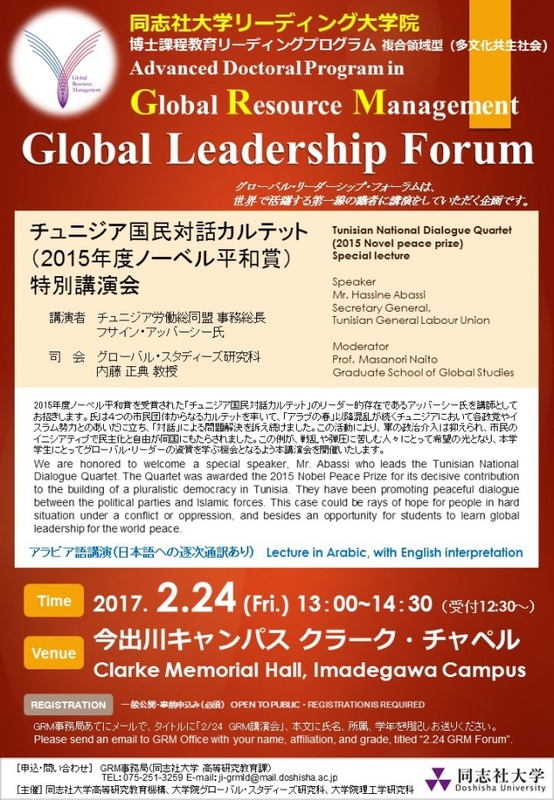 We are honored to welcome a special speaker, Mr. Abassi who leads the Tunisian National Dialogue Quartet. The Quartet was awarded the 2015 Nobel Peace Prize for its decisive contribution to the building of a pluralistic democracy in Tunisia. They have been promoting peaceful dialogue between the political parties and Islamic forces. This case could be rays of hope for people in hard situation under a conflict or oppression, and besides an opportunity for students to learn global leadership for the world peace. To attend the conference, registration is required. Please send an email to GRM Office with your name, affiliation, and grade, titled “2.17 GRM International Conference”. *Please show your identification (student card, driver's lisence) at the reception.